Behold my science experiment! This used to be the battery from my 2007 MacBook Pro laptop. But now, I believe I’ve discovered a new life form. The lithium-ion battery from my old Apple MacBook Pro laptop encountered a massive failure a few weeks back before my family’s beach vacation. Two of the six chemical packs, which comprise the battery’s guts, started growing in size. One morning I picked up my laptop and noticed a small but unsightly bulge under the unit. 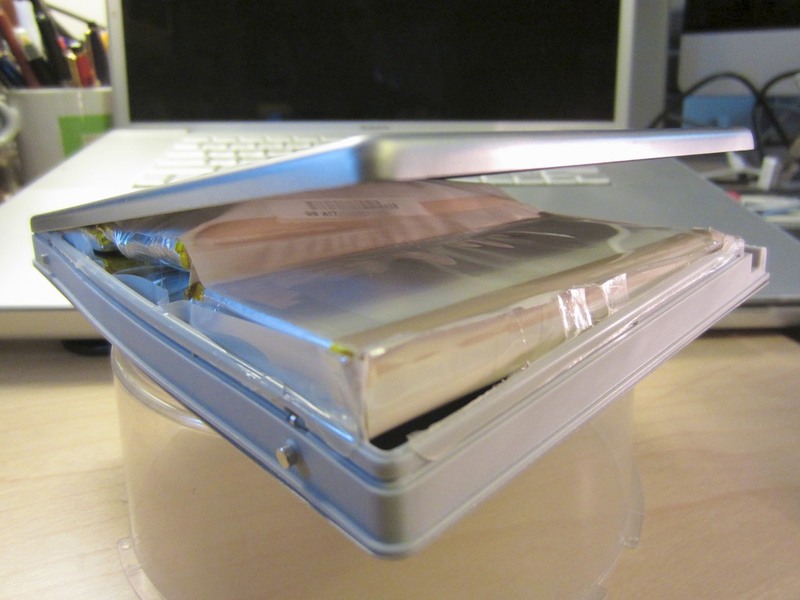 A few days later, the battery’s bump got larger and now was also pushing inwards, creating pressure on the computer’s trackpad. When I tried to use my laptop, the trackpad was frozen from the pressure, rendering the computer somewhat limited. I had no choice but to remove the battery and go on vacation with the computer entirely reliant on its electrical tether. When we returned home a week later, my battery had mutated into an alien life form and was battling local pest-control agents for rulership of my street. Okay, it wasn’t that bad, but my swollen battery had certainly been eating its Wheaties. Now, the top had split open, as the two lithium-ion cell envelopes were continuing to balloon in size. They hadn’t burst open, but I was especially thankful Apple makes its batteries without mercury. So I decided to make my former power source into a little science experiment. I want to see how big it would grow. I sealed it into a Ziploc plastic baggie in case of leakage, cordoned off a section of my house with yellow hazard tape, and waited. Over the next week, its growth slowed, but I did have a lot of time to think. Had my life just turned into a bad science fiction movie? Usually in those plots, mankind is somehow to blame for the creation of the (fill in the blank) horror. Did I have something to do with this? I thought back to the day I spilled coffee all over my desk. Coffee seepage could certainly be the culprit. I now had access to my battery’s innards, and I could clearly see there was no evidence of a coffee invasion. Then, later that week, a friend of mine with the same old MBP line told me that he had recently experienced the same problem with his battery. So I powered up my iMac and did a little research. Apple says on its Notebooks Info Page that its current batteries can last up to five years. My pregnant battery was… well, already five years old. So it certainly didn’t die prematurely. But what about its sudden super nova-like quality? That particular detail is not in Apple’s literature. First of all, I was not alone. One engineer blamed my battery’s mutation on ‘thermal runaway’ (overheating), which is initiated by a chemically created heat overload. Another tech geek talked about the resulting potential for a fire hazard. Apparently, poor battery charging habits (overcharging) can cause this problem to crop up. So you need to exercise your battery’s electrons and periodically drain the battery and fully recharge it to maintain its healthy condition. It involved rupturing the bloated metal covered envelope with a pin to allow for the release of the pent up gases. That sounded a wee-bit dodgy. I decided this was an extremely bad idea. I will NOT be trying this at home (no disrespect to my fellow blogger). So I continued my research through the X Files. Then, finally… I spotted it! I triumphantly uncovered the news that Apple had officially acknowledged the problem back in 2007 with my generation of battery (model number A1189), and issued a recall and replacement program. But the replacement program ended in May of 2009. I was three years too late. Talk about missing the train. But I did get my five years with the battery. Time to pony up, buy a new power buddy for my MBP, and move on. So I paid a visit to my conveniently located Apple Store at Grand Central Terminal in New York City. I sat down at the Genius Bar, explained my situation, and gently pulled the science experiment out of my workbag as if to display a priceless ancient artifact. The Apple Genius stared at the bulging plastic baggie. He said, “Yes, I’ve seen that before,” with zero emotion. “But is it normal to do that?” I replied. Mr. Spock chose his words very carefully. We went through the obligatory diagnostic questions, which simply confirmed the obvious: Because my battery was years beyond its warrantee, I needed to purchase a new one. Deep down though, I was hoping for a little more from Apple. The Apple Genius explained I could buy a new battery for $99 at the Genius Bar with a three-month warrantee or purchase a battery in the retail section of the store for $129 with a one-year warrantee. Despite my “Jabba the Hut” sitting next to me, I had enough faith in Apple that another battery would last beyond three months. I’d happily save the thirty bucks. He said he would check for it in the back and quickly disappeared. I watched a few Apple shoppers typing feverishly on new laptops for sale. Where could my Genius have gone?! Finally, he reappeared holding a new battery box. I reached for my wallet. He looked at me and started talking. When he was done, he stared at me, waiting for a response. The problem was… I wasn’t exactly sure what he said. It was kind of complicated. Something about his parts inventory not having the new battery onsite. But he had located the battery in the retail section. However, he was unable to sell me the retail battery at the Genius Bar. He implied it was against the rules. He could order another battery for me through the Genius Bar, but it would take four or five days to come in, and he didn’t want me to be without my laptop for that long. Plus it was a holiday weekend, and there was plenty of inventory left. And then he asked me to make a choice. Did I want to pay the retail price or go with the non-retail choice? I thought for a moment. But there was no non-retail choice. He just told me he couldn’t sell me the very battery he was holding in his hands! I looked into his HAL-ish eyes. They offered me nothing. But deep down, I could tell he was winking at me. He broke open the box and handed me the battery. And then he took my science experiment. On the bottom of my Apple Store receipt, there was $129.00, and on the top, there was ($129.00). That math on that makes- $0. I shook his hand as he sent me on my way, and I told him that he had made my day. And then finally, I saw it. So I’ve been thinking a bit about my free replacement battery. This act of… corporate generosity. I’m just not used to that kind of thing. And I’ll never really know why it happened. Maybe this was Apple’s unofficial way of apologizing five years later for a badly made battery. Maybe this was an Apple Genius adroitly taking advantage of a glitch in the system. Maybe Apple purposely creates these ‘windows of opportunity’ for Apple Geniuses to use at their discretion. Clearly, my Genius exercised his personal sense of responsibility to solve my problem, and then some! And he was enabled to do this by a company that prides itself on amazing customer service. Actually, the best way to rewind back the pregnant battery term closer to the concieving date is by applying exact voltage 4.2V current limited @100mA to affected cells for a few days/weaks @ room temp – it tends to reduce swelling (gassing reaction is somewhat reversible). Charge up all 3 banks separatelly (do a ballancing charge), then preform a capacity check using Imax RC charger @ 100ma @ each cell. If the capacities are withing 3% or each other – charge the whole battery, othervice some of the separate cells may be still usable for LED garden lights projects / putting USB power packs on steroids :-). Read LiPo safety notes befor proceeding / do experiments in the fire proof place/surface. Had the bulging battery issue ourselves… several years after Apple had replaced one that wasn’t holding a charge. Perhaps you just were witnessing your computer in its chrysallis stage – if you had let it continue – maybe it would have turned into a beautiful butterfly Ipad?! LOL The one thing that I just wish they could do – is just come out and say things – but am sure its against company policy. I don’t consider myself a dumb person – but sometimes I’m not ‘quick on the uptake’ if they were doing me a favor like that. Ah yes… the mysteries of life.